To combat PMS in a natural way, it can be a good idea to consider switching to using essential oils for menstruation. They are cheap, they are natural and they actually work. The next time your menstrual cramps kick in, you should consider reaching for essential oils rather than medication, but we know how confusing it can be if you have never ventured into the wonderful world of aromatherapy before, so here are some of our favorite essential oils for menstruation, and tips on how to use them. Without a shadow of a doubt, the most effective essential oil, for more than one reason, is Lavender. You will often find Lavender scents in a lot of your favorite soaps, bath creams and candles, thanks to it’s ability to dramatically calm you, as well as relieving headaches and anxiety symptoms. Lavender oils is known for it’s anti-inflammatory effects on the body, which has been shown to improve blood flow, ultimately reducing the intensity of stomach cramps. If you could only choose one essential oil for your menstrual cramp pain relief, let it be Lavender. One of the most powerful natural pain killers is marjoram. It’s analgesic properties have been proven to reduce the pain from a variety of different symptoms, including PMS. Not only does marjoram oil reduce the pain, it also helps to dilate the blood vessels and reduce blood pressure, which in turn will reduce the inflammation and the pressure on the uterus when that time of the month comes around. For those who currently suffer from irregular or obstructed menstrual cycles, the emmenagogues that are found in Rose essential oils have been shown to stimulate the production of hormones which help to induce menstruation. It sound counter intuitive, to prescribe a menstruation inducing oil to people who suffer with PMS symptoms, but when you couple the benefit of having a regular menstruation cycle with the anti-depressant properties that Rose oil provides, you can at least enjoy a more stable, less anxious episode when the time finally comes around. Another popular essential oil for pain relief during menstruation is Geranium oil. It’s soothing properties have been shown to reduce the amount of tension on the uterus, as well as relaxing the blood flow to and around that area, making the pain far less noticeable. Geranium is also known for it’s hormone balancing properties, which can prevent the onset of anxiety attacks and stress during the menstruating period. Ginger essential oils, and ginger root in general is often touted as one of the best natural pain relievers on the planet. When concentrated down into an essential oil, Ginger can provide substantial pain relief when applied to the affected area. Rich in a substance called Zingibain, Ginger can also help to reduce inflammation in the body, ultimately reducing swelling in the uterus area, causing less intense cramps. 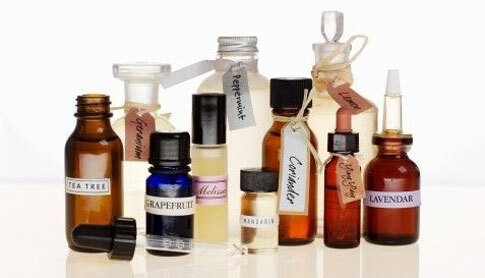 A quick and easy way to make use of an essential oil is to add a few drops to your bath water. The aromas will ignite when they come in contact with the hot water, allowing you to completely relax whilst they work their magic. You only need a few drops to feel the benefits. Making use of an aroma diffuser is one of the best ways to benefit from essential oils, because the aroma is spread throughout the entire room constantly, allowing you to reap the benefits of the oils while you continue doing what you would normally be doing. If you don’t have access to a diffuser, then you can simply go ahead and breath in the oils from either the bottle, or your bare hands. The premise is still the same, and the effects are still as strong, but a diffuser would still be the best choice. One of the most effective ways of administering essential oils for pain relief is to massage them directly into the affected are, which in this case is the lower abdomen. Essential oils are pretty tough to massage into the skin directly, so we always recommend that you mix a few drops of your favorite essential oil with a regular massage oil or cream before applying it to the skin. Research has shown that massaging essential oils into a painful area of the body can help reduce pain by up to 50%, and the benefits are typically felt within a few minutes.